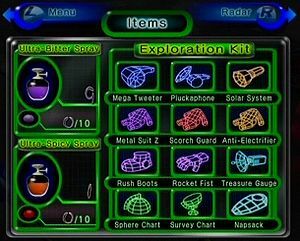 The Exploration Kit, as seen in Pikmin 2's pause menu. For the updates to the games's software, see update. Throughout Pikmin 2 and Pikmin 3, the leaders receive various upgrades. These are granted when specific objects are brought back to the ship. 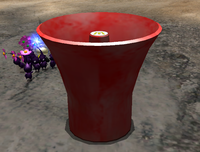 In Pikmin 2, the upgrades can be found on a checklist called the Exploration Kit on the pause menu, and there is a distinction between the treasure itself and the upgrade. In Pikmin 3, upgrades are obtained in the form of Gashapon style capsules or cellphones, and there isn't much of a difference between the object and the upgrade proper. In Pikmin 2, collecting the treasures that give Exploration Kit upgrades is done by defeating the final boss of a cave, with the exception of the Spherical Atlas, which is not guarded by any enemy more dangerous than a Snow Bulborb, the Geographic Projection, which is found above ground and also in the open, and the Brute Knuckles, which is obtained from a Mamuta on a rest sublevel of the Frontier Cavern. In Pikmin 3, the spacesuit upgrades are found buried or off the beaten path. The two phones that allow for further exploration are obtained from defeating bosses, however. As soon as their associated object is collected, the upgrades take effect right away, and for all leaders. In Pikmin 2, if the player gets an upgrade's treasure and exits the cave from the pause menu instead of through a geyser, the treasure will be left behind, but the leaders will keep the upgrade. In both games where new areas are discovered by collecting a specific object, there are only two such objects. The Sphere Chart is the name given by the ship to the data found within the Spherical Atlas. By collecting the Spherical Atlas from the Emergence Cave, the ship is able to create charts of the Awakening Wood, allowing the player to explore that area. The Survey Chart is the name given by the ship to the data found within the Geographic Projection. By collecting the Geographical Projection from the Awakening Wood, the ship is able to create charts of the Perplexing Pool, allowing the player to explore that area. The Data Glutton is an old cellphone, and is found within the belly of the Armored Mawdad in the Garden of Hope. It emits a signal that Alph and Brittany first assume to be Charlie. Upon collecting the phone, Alph uses its technology to boost the signal strength of the Drake, allowing them to access the Distant Tundra. The Data Glutton being scanned. The Data Glutton is rewarded for defeating the Armored Mawdad. The Folded Data Glutton is a more modern, folding cellphone, found within the belly of the Sandbelching Meerslug in the Tropical Wilds. It emits a signal that the leaders first assume to be Olimar. Upon collecting the phone, Alph uses its technology to boost the signal strength of the Drake, allowing them to access the Twilight River. This cellphone has an image of two ferrets on its display. Despite its supposed lack of recent use, the interface on the phone claims that its current battery life is quite high, implying that it was either recently charged, or has been only recently turned back on after a long period of dormancy. One can throw Pikmin at it when it is first found and have them dig it out without triggering the cutscene where the boss awakens. This is possible if the leaders are positioned just far away enough to not trigger the event, but still close enough for the Pikmin throw to reach. However, the Pikmin will never make any progress towards digging it out, forcing the player to face the boss. Alternatively, using a sequence break involving the Dodge Whistle, it is possible to observe this behavior regardless of proximity, by reaching the Meerslug's arena before rescuing Charlie from the Vehemoth Phosbat. The Folded Data Glutton being scanned. The treasure buried in the sand. The treasure next to a deceased Sandbelching Meerslug. Pikmin carrying the Folded Data Glutton. These upgrades enhance the abilities of the leaders' spacesuits more generally, either by giving them resistances, boosts, or entirely new abilities. The Scorch Guard's capsule in Pikmin 3. The Scorch Guard is an armor upgrade that makes all leaders' suits impervious to fire. In Pikmin 2, it is obtained by defeating the Emperor Bulblax in the Bulblax Kingdom, and collecting the Forged Courage. In Pikmin 3, it can be found buried on a ledge to the north of the strip of wood Pikmin and leaders hop to when the lily pad ride ends. The Burrowing Snagret and Desiccated Skitter Leaves could stop the Pikmin from carrying this piece back. Should the paper bag outside the Snagret's arena not be pushed down, the Pikmin may take a longer route to the Drake, which involves some Desiccated Skitter Leaves, an Arachnode, and a Flighty Joustmite. With this upgrade, there is no need to worry about being hurt when destroying fire geysers, or fighting enemies such as the Fiery Blowhog or Fiery Bulblax. However, the Titan Dweevil's Flare Cannon will still be able to stun leaders, even if it does not harm them. Location of the Scorch Guard. Closeup of the Scorch Guard in Pikmin 3, after being dug out. Blue Pikmin carry the Scorch Guard. 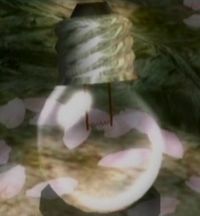 The Anti-Electrifier's capsule in Pikmin 3. The Anti-Electrifier, when unlocked, makes the leaders' suits immune to electricity, including electrical attacks. In Pikmin 2, it is obtained by defeating the Giant Breadbug in the Glutton's Kitchen, and collecting the Dream Material. In Pikmin 3, it can be found buried near the place where Charlie crashed onto the planet's surface, guarded by an Arctic Cannon Larva. This device is particularly useful when trying to pass by electrical hazards with a group of Yellow Pikmin. Although leaders become invulnerable to electrical attacks, the Titan Dweevil's Shock Therapist will still manage to stun them, despite not causing any damage. Close up of the Anti-Electrifier after being dug up. The Metal Suit Z's capsule in Pikmin 3. The Metal Suit Z increases the integrity of the leaders' suits, reducing damage taken by half. In Pikmin 2, it is obtained by defeating the Pileated Snagret in the Snagret Hole, and collecting the Justice Alloy. In Pikmin 3, it can be found on a strip of path that connects the shore near the Mock Bottom and the place where Alph crash-landed, and must be reached by throwing leaders up either side. To note is that the Hermit Crawmad near the bridge could interfere with the carrier Pikmin. This upgrade is useful for attempts in defeating a large Bulborb or Spotty Bulbear with leaders alone without coming to much harm. The Hocotate ship in Pikmin 2 claims that it will make enemy bites and being stepped on produce minimal pain. This is a gross simplification on its part, intended to avoid having to explain the intricacies in detail. In reality, all sources of pain will be reduced dramatically, not just those two, and enemies like Shearwigs and Wollywogs will still produce a significant amount of damage. Close up of the Metal Suit Z. The Napsack can be obtained by defeating the Burrowing Snagret in the White Flower Garden, and collecting the Five-Man Napsack. This upgrade provides a quick method of returning to the Pikmin Onions above ground or the Research Pod when underground, which is achieved by holding / once it has been obtained. When used, the leader in control falls asleep, and any nearby Pikmin, up to a maximum of four, carry him to their associated Onion (or Research Pod), a minimum of just one being required. 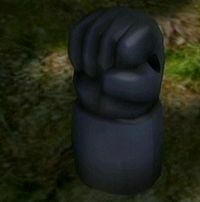 The Rocket Fist can be obtained by defeating one of the Mamuta in the Frontier Cavern, and collecting the Brute Knuckles. It enables a new, stronger punching combo attack for use by the leaders, which makes defeating enemies with leaders alone much easier and more efficient. Without the upgrade, the / button will produce a simple right punch. Once this treasure has been collected, pressing / a second time will perform a left-hook, and a third time launches a devastating wind-up punch. Due to a glitch, punching while moving makes the attacks come out faster, which greatly boosts the Rocket Fist's effectiveness. The Rush Boots can be obtained by defeating the Empress Bulblax in the Frontier Cavern, and collecting the Repugnant Appendage. 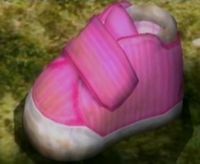 It is a modification to the leaders' footwear that allows them to run more quickly, around 1.29 times faster, or at around the same speed as flowered White Pikmin. The Rush Boots also renders the blowing attack of Puffy and Withering Blowhogs ineffective against leaders. The ship explains both functions as the result of lowered air resistance. It can provide to be a minor hindrance however, as the Pikmin's speed is not increased alongside the leader's, so they fall behind, are harder to control and often get stuck when going around corners. These upgrades are specifically for the leaders' whistle. The Mega Tweeter (メガ・スピーカー?, lit. : "Mega Speaker") is obtained by defeating the Ranging Bloyster in the Shower Room, and collecting the Amplified Amplifier. This upgrade increases the range of the whistles of all leaders. The diameter of the visible circle projected on the ground increases to about 144% of its original size, thus more than doubling the area the whistle affects. This makes it easier to call scattered Pikmin to the leader's side, even when being slow in the Onions. The Pluckaphone is obtained by defeating the Waterwraith in the Submerged Castle and collecting the Professional Noisemaker. It is an upgrade that allows the leaders' whistles to call buried Pikmin out from the ground, saving precious time that would otherwise be spent plucking them out. As well as picking newly produced Pikmin at the Onions, this is useful for calling out Pikmin that were planted by a Mamuta or a Swooping Snitchbug, or transformed by Candypop Buds. In the first trailer for Pikmin, Olimar is seen calling Pikmin from the ground, so the Pluckaphone may be an implementation of a prerelease element from the first Pikmin game. The Dodge Whistle can be found on a small cliff a short distance away from the exit to the Vehemoth Phosbat cave, where the Pikmin will carry the spoils of the battle through. It can be obtained by throwing Pikmin onto the Bouncy Mushroom between it and the path. There are some enemies in the way, however: two Swooping Snitchbugs are guarding the object, and Joustmites, Skeeterskates, and Bearded Amprats can be found on the route the Pikmin will use to take it to the Drake. However, this all can be bypassed by having Winged Pikmin carry it. Collecting it allows the leaders to dodge left or right, guiding the Pikmin. It is done in a straight line normally, or in a circular fashion around a lock-on target. When rolling, the leaders do not lose height, making certain sequence breaks possible. Closeup of the Dodge Whistle's capsule. The Solar System can be collected by defeating the Man-At-Legs in the Subterranean Complex, and collecting the Stellar Orb. It is a device that will illuminate any sort of darkness inside a cave's sublevels. This way, it is possible to see things that are very far away when underground. Although the name refers to a system that produces solar-like light, it is also a play on words on the system that planet Earth is located in. When it is collected, the game gradually changes the cave's lighting to fit the new, brighter settings. This lasts around 3 seconds, and can be seen on the retrieved treasure analysis cutscene. Oddly, the upgrade has an opposite effect on sublevel 10 of the Cavern of Chaos: the sublevel will be darker if the Stellar Orb was retrieved. The reason for this is because this sublevel uses the lighting configuration file light.ini, which is both only used on this sublevel, and the only configuration file that is in the version 0000 format (besides any unused files and settings in the disc). All other sublevels use a file in the 0001 version. Version 0000 has no support for different lighting with and without the Solar System; it only has one set of data for lighting instead of two. When a lighting file on this version is loaded into the final game, the values that are there are used to light up the cave when the Solar System is present, and because there is no data for what lighting to use when the upgrade is missing, it uses some default values. These default values make the tenth sublevel of the Cavern of Chaos look lighter when the upgrade has not been collected yet. Sublevel 10 of the Cavern of Chaos before collecting the Stellar Orb. The same sublevel after collecting the Stellar Orb. The Treasure Gauge is a helpful device found in Pikmin 2 that helps with tracking down every treasure in the game, no matter if is out in the open, an enemy has it or it is buried. It is obtained by collecting the Prototype Detector from the Empress Bulblax in the Hole of Beasts. When it is in the Exploration Kit, a gauge appears on the HUD. In it, there is a needle that wiggles continuously when a treasure is in the current field or cave, and the closer the current leader is to a treasure, the farther to the right it goes, and the harder it beeps. It can be interfered with by the Antenna Beetle, the only Exploration Kit upgrade to be specifically targeted in gameplay. In Hey! Pikmin, upgrades are provided by the S.S. Dolphin II, after the player collects certain amounts of Sparklium. These become unlocked at the specified levels of Sparklium, and don't decrease the Sparklium count when doing so. Radar 2,000 Allows the player to toggle the radar on the top screen with / . 4 health bars 6,000 Gives Captain Olimar an extra bar of health. Enemy logs 10,000 Allows access to the enemy category in the logs. Extended jetpack duration 14,000 Allows the jetpack to fly for longer. 5 health bars 18,000 Gives Captain Olimar an extra bar of health. Maximum jetpack duration 22,000 Allows the jetpack to fly for longer. 6 health bars 26,000 Gives Captain Olimar an extra bar of health. Alph encounters the Dodge Whistle. The Metal Suit Z is encountered by Charlie. Brittany finds the Scorch Guard. The Dodge Whistle once returned to the Drake. The Metal Suit Z once returned to the Drake. The Anti-Electrifier once returned to the Drake. The Scorch Guard once returned to the Drake. Location of the Metal Suit Z. In this case, it is on a ledge next to Charlie. Location of the Scorch Guard. In this case, it is on the ledge right next to Alph. The data file for the Dodge Whistle. The data file that corresponds with the Metal Suit Z. The data file that explains the Anti-Electrifier. The data file for the Scorch Guard. In the North American version of the New Play Control! game, with the language set to French, the Sphere Chart is called "Carte Sphérique" (Spherical Map) in the Ship's dialogs and "Système Solaire" (Solar System) in the pause menu. Since another upgrade is also called "Système Solaire" (the Solar System), this is likely a mistake. French (NoE) Combifer Ironsuit Portmanteau of "Combinaison" (suit) and "fer" (iron). French (NoE) Méga Tweeter Mega Tweeter The English name has been kept for the French version. This page was last edited on April 12, 2019, at 16:23.